One of my plans this summer is to read as much as I possibly can. I am going to start a list and I’ll keep adding to it throughout the summer. I would also love to hear your recommendations (keeping in mind that I like kid’s stuff the best). I am also reading The School Year Survival Cookbook by Laura Keogh and Ceri Marsh along with articles and books related to school and teaching. Messy Jessy Gets Active is now officially available. As the second book in the Messy Jessy series, it is available on-line through Amazon or you can contact me (click on the contact tab above). Anxiously awaiting my latest book. 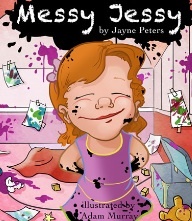 Children loved Messy Jessy in her debut story. Now, she is busier and more active than ever. Follow Jessy as her wild imagination has her tackling what she loves. Jessy’s day continues to be filled with laughter, spirit and … mess. ~parents and kids will instantly relate.